A RECORD 5.1 million containers were lifted at Australia’s monitored container terminals during the 2017/18 financial year, reflecting annual growth of 8.1pc, particularly on higher volumes in Melbourne, Fremantle and Sydney, according to an ACCC report released yesterday. It’s 20 years since the ACCC began monitoring the activity of Australia’s container stevedoring businesses. Higher productivity and much lower costs have been delivered since the government implemented waterfront industry reforms in the late 1990s. Today’s waterfront handles five times the number of containers compared with 1998/99. A 1998 study found that overseas terminals performed better, though with innovations and reform since that time almost every aspect of container handling has changed. Net crane rate containers per hour has increased from 19.6 per hour to 28.5/hr. While greater competition by stevedores and investment in automation has led to efficiency gains, the companies’ return on assets has dropped by about four fifths over that time. Growing container volumes helped to grow total industry revenue by 6.8 per cent in 2017–18. This was despite stevedores reporting lower average quayside revenue per lift (a proxy for the average price paid by shipping lines). 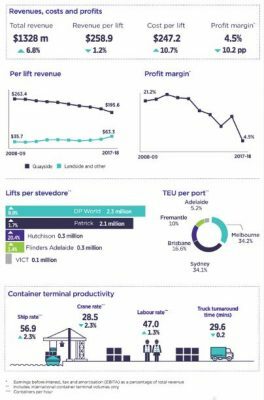 Quayside revenue per lift fell 8.5pc to $195.6, driven by increased competition among stevedores for shipping line contracts, particularly at the three east coast ports which now each have three stevedores. Quayside revenue per lift has fallen by more than 20pc in the five years since Hutchison entered the industry. In contrast, the average amount of landside and other revenue has increased by 37.7pc to $63.3 per lift in the same period. It is the hike in this category of revenue which has raised the ire of customers and the carrier who cart goods for them. Every stevedoring company at every monitored container terminal in Australia has hit users with a new levy they call an infrastructure charge. Shipping lines have been able to negotiate cheaper rates because of growing competition between stevedores and consolidation in the shipping line industry, resulting in an 8.5pc fall in quayside revenue per lift for stevedores. However, stevedores continued to rapidly increase infrastructure charges applied to truck and rail companies delivering or collecting containers at port, which has led to strong criticism from transport operators and cargo owners. 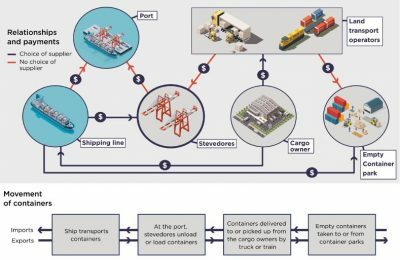 Container supply chain relationships and flow of money. 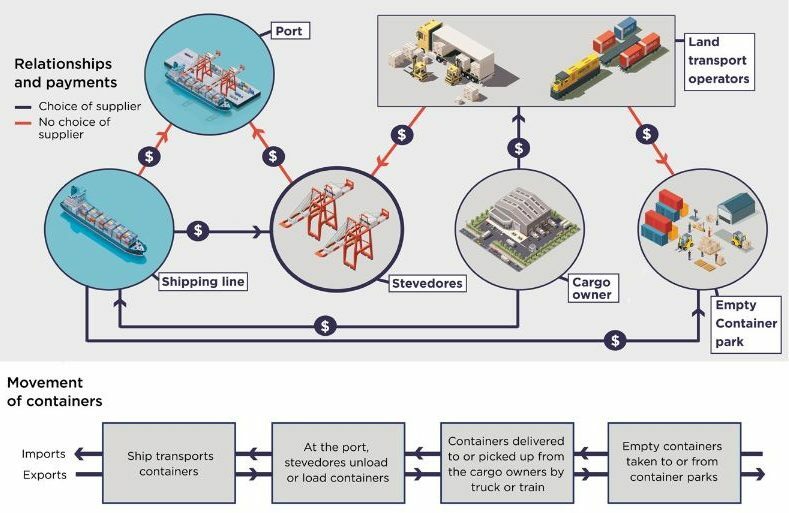 “The use of infrastructure charges means that stevedores can earn a growing proportion of their revenues in a market in which their market power is stronger relative to the more competitive market in which they provide services to shipping lines,” according to the report. On the other side of the coin, stevedore DP World embarked on a $256 million capital expenditure including nine new ship-to-shore cranes costing around $14m each. Flinders Adelaide committed to expenditure to help its terminal handle larger ships. As a combined industry, stevedore profitability fell sharply in 2017–18. All stevedores reported a reduction in profits, with total profits across the industry declining from $183m in 2016–17 to $60m in 2017–18. Operating profit margin declined from 14.7pc to 4.5pc. This is measured as earnings before interest, taxation and amortisation (EBITA) as a percentage of revenue. Return on tangible assets fell from 7.2pc to 2.1pc in 2017–18. Industry aggregate figures such as these mask very different performances between established stevedores and the new entrants. The aggregate figures in 2017–18 were also pulled down by the inclusion of data of stevedoring company, VICT, for the first time. However, profitability was also impacted by both a reduction in tariffs charged to shipping lines and an increase in operating costs. Quayside productivity of the stevedores was mixed in 2017–18. The ship rate, which measures the number of containers transferred to or from ships using the combined input of labour and cranes, increased by 2.3pc to 56.9 containers/hr. The net crane rate is an indicator of capital productivity and measures the number of containers handled per crane hour while cranes are in operation. The net crane rate fell by 2.3pc to 28.5 containers/hr. Labour productivity increased slightly in 2017–18. The elapsed labour rate increased by 1.3pc to 47 containers/hr. Industrial relations remain an ongoing challenge for the industry. All five stevedores were impacted by industrial action during 2017–18. This included the blockade which closed the new VICT terminal in Melbourne for 19 days over November and December 2017. The blockade was deemed unlawful by the Supreme Court of Victoria. Truck turnaround times are a measure of landside productivity and reflect the time that stevedores take to load or unload containers on trucks at their terminals. National truck turnaround times have improved over the past seven years, from 33.9 minutes in 2011–12 to a record low of 29.6 minutes in 2017–18. This figure improved by 0.2 minutes in the last year. Average truck processing times improved by 3.9 minutes in Melbourne, but deteriorated by 1 minute in Sydney.